This 25 minute lesson uses the game Elegy for a Dead World to help teach students how to write a story and what sort of perspective they can bring that will change a story. Students will be able to write a short science fiction story using sentence starters and the game Elegy for a Dead World. How do things change when we view or interact with them? No matter how thoroughly we present information, people can take it different ways. Writing is a selection process where we decide what details are most important. If the goal of writing is to communicate, we need to be able to choose exactly what and how we wish to communicate our ideas. The reader/viewer plays a part in what information is communicated. We often cannot choose who views something or how. When we are the reader, it’s important to recognize what the author/creator might have wanted and what perspective we bring to the reading that may change things. Imagine you’re an alien from another world and you’ve come to earth for the very first time. You find yourself in your real bedroom and as you’re looking around you find an unfamiliar object. What do you find and what do you think it is? What is it really? Take three minutes to write about your object. Today we’re going to be working on sentence starters and playing a game. Before we can play, though, I’m going to walk you through what sort of sentence starters to expect and we’ll try a few before you jump into the game. How would you finish this sentence? Display a sentence starter from Elegy for a Dead World. Which ones did you really like? Why? What do the good sentences have in common? What do you think this person brought to this sentence? What sentence surprised you most? Why? What do you think could make this sentence stronger? What more would you like to know about this sentence? Fire up Elegy for a Dead World and go to town. At the end, there’s an option to print your story. Normally, it would take at least a half-hour to play through this game and get a story, so, since this is a mini-lesson, we’ll take turns filling in the sentences. How we finish the sentences changes where the game goes, so when you have the chance to play on your own, consider what’s different each play through. If you choose to extend this to a full lesson, have students play individually, discussing the differences in where the game goes. Additionally, collecting their stories at the end can give you a good idea of how they’re writing. Playing through again a few weeks down the line can give you a comparison for growth. Hopefully you’ve seen how our perspective can change the way we read and write things. Thinking about how visitors to our writing read things when we’re not clear, we can take this further and realize exactly how technology, imagery and iconography can change the meaning of our reading and writing. This 25 minute lesson teaches the syntax and semantics through an examination of genre and the way it works for the film Serenity. Students will be able to define syntax and semantics by identifying the syntax and semantics of a genre of their choice in a short journal entry. How do syntax and semantic change the way we read something? Semantics is how the words/meanings/visuals function within a genre. Semantics is needed to create meaning. Syntax is the grammar and structure that separates each genre. Syntax is needed is needed to separate and make understanding easier. In combination, the two work together to create or break expectation and narrative. Both exist outside of language. 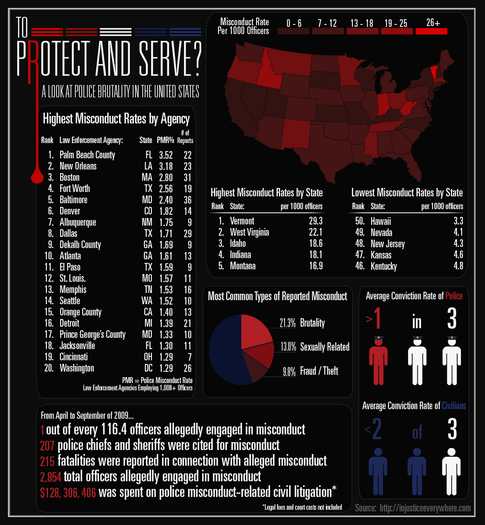 Both can be applied to difficult issues to see how misconceptions are created and perpetuated. What elements do you expect to see in a western? How about a science fiction story? Write their answers in list form on a whiteboard or large post-its. We’ll need this list later. Watch the video from 1:02 to 2:04. Pause to identify syntax and semantics of genre. The video just defined them for us. Let’s write that down. Alright. We have our list of things we expect in each genre. We’ve just defined syntax and semantics. Now we’re going to see if we can connect the definition to our list. Go down the list and label each item syntax or semantics. Converse about why is fits each one. Ask if other genres use that item or convention. Once the list is complete, ask them for specific examples that weren’t listed to expand the list. Continue the video to 10:06 so they can see the long list of conventions covered and the ways in which Serenity uses or break away from them. So you can see that the semantics of a genre is the iconography and what, in any given moment, would let you recognize the genre. The syntax, meanwhile, are the elements of the plot, the tropes, and the pieces of narrative that set that genre apart. For the next five minutes I’d like you to choose another genre: horror, romance, vampire stories, coming of age stories, adventures, whatever you like. You can work with a partner or alone. Brainstorm the syntax and semantics of the genre and create a few sentences that identifies each in your journal. If you’re working with a partner, you both need to have it written in your journal and you need to list your partner. We had a chance to look at the syntax and semantics of genre today. These ideas, the way something can be broken down into it’s parts, allows us to see the actual meaning beneath the words and structure. It also allows us to play with the meaning, words and structure. Tomorrow, we’ll look at semantics and syntax related to language and the specifically the language of racism in regards to the arguments about Syrian refugees and the way they mirror the same arguments against Jews in the 1940s and other minorities and refugees in years past. Teachers will be able to define bow tie, Windsor knot, four-in-hand knot, and half-Windsor knot, Sheltered English Instruction, and Collaborative Strategic Reading. Teachers will be able to identify elements of Sheltered English Instruction in the lesson. Teachers will be able to demonstrate how to tie one or more of the four knots. Teacherss will be able to critique Emerging Bilingual strategies on the basis that the strategies listed in the article are primarily designed for equal or majority English speaking classrooms. What do does “success” mean in regards to EBs? Emerging Bilinguals can be academically successful. Success for Emerging Bilinguals is defined in academic terms. Success for Emerging Bilinguals emphasizes English. Success for Emerging Bilinguals is often considered indoctrination to US academia. Success for Emerging Bilinguals can sometimes ignore cultural needs or differences. Because success for Emerging Bilinguals is in English academia, even good Emerging Bilingual programs may ignore a student’s capabilities in their other language. Emerging Bilingual programs are reliant on English instruction and English classmates. Emerging Bilinguals need vocabulary to be successful, as grammar is often innately learned. Emerging Bilinguals need time to process to be successful, since they lack automaticity. Emerging Bilinguals need support in both languages outside the classroom to be successful. Emerging Bilinguals need a sense of self-worth that is not maligned by their slower learning curve. Academia and Administration define the needs of Emerging Bilinguals instead of the Emerging Bilinguals themselves. What is an Emerging Bilingual or Dual Language Learner? How is language and dialect different? Can we consider students with dialectical differences similar to emerging bilinguals? In their article, Almanza de Schonewise and Klinger discuss many of the issues facing the education of Emerging Bilinguals. In the latter third, they outline three techniques and give vague overviews of their application to help EBs: Sheltered English Instruction, Vocabulary Instruction and Collaborative Strategic Reading. The first and last of these describe specific methodologies that can be applied in a classroom, while vocabulary instruction merely encourages differentiation and lists a few techniques to do so. In Sheltered English Instruction, the intention is to slow down and provide EBs with more space to succeed. In Collaborative Strategic Reading, EBs are partnered up, preferably with a successful English speaker, in order to better success and be supported. These two ideas are not mutually exclusive. Because my French isn’t good enough to be comfortable putting you at a disadvantage, we’re going to use my class privilege and discuss language and skill within upper class gentrification. More specifically, I’m going to teach you how to tie a bow-tie using some of the methodologies of Sheltered English Instruction. There are dozens of different types of knots . The Boy Scouts offer badges in knot tying, and most are used in camping, climbing and sailing, all leisure activities for those people in privilege. In addition, there are four common types of neck-tie knots: Windsor, Half-Windsor, Four-in-Hand Knot, and a Bow-Tie Knot. Each has its own level of social statement when with the upper-crusters. The Four-in-Hand Knot is your basic neck-tie knot worn by most business men; it’s simple and straight forward, though it occasionally ends up a little lopsided. The Windsor Knot is the king of neck-tie knots, requiring extra loops that prevent the lop-sidedness and create a perfectly triangular knot. At boarding school, we were required to wear ties three days a week, and those that could tie a good Windsor were often treated with more respect. The Half-Windsor also creates a more triangular knot and is less lop-sided, but doesn’t use as much tie in the knot; for people who couldn’t afford extremely nice, thin, silk ties, this allowed thicker, cheaper materials to mimic the slightly fancier Windsor knot without puffing out. I do have some neck ties here for you to play with, but we’re going to concentrate on the ultimate formal neckwear: the bow-tie. In front of you, you have a bow tie. You also have a visual diagram, a list of instructions, and my tablet with two or three videos showing you how to tie it. In Sheltered English Instruction, they emphasize choosing less material, hence why we’re only using bow-ties, and delving into it in greater depth to allow more processing time. I will walk you through tying a bow-tie once right now. After, in your independent practice, I want you to use a video to help you tie it, the picture to help you tie it, and the instructions to help you tie it. Demonstrate and explain how to tie a bow-tie, have them tie it along with you. How many of you had tied a tie before? How many of you know how to tie more than 3 types of knots? If you knew 3 or less, you can think of this exercise as mimicking the experience of being an emerging bilingual in the classroom. How does that change how you feel about the repetition of tying a bow-tie? Ok, so now, you will tie your bow-tie without my help 3 times, using each of the guides provided. Don’t worry if you don’t get it right; it’s difficult. While you’re doing this, reflect on which aid, including our group tying, worked best for you. Also consider whether you think your best knot happened because of the materials or because you were given the time to practice. Knots have a certain language of their own. Additionally, neck ties and bow-ties speak specifically to a class difference and an expectation of etiquette. When working with EBs, we can give them vocabulary, effectively dressing them in a tuxedo, and they can functionally pass in their English classrooms, but we’re doing them a disservice not being patient and letting them gain a deeper understanding, i.e. knowing what each knot will say to people already indoctrinated to this other culture. As you think about the techniques you’ll use to deal with EBs, make sure you consider whether you’re providing them the tools for social mobility or if you’re merely playing dress-up. 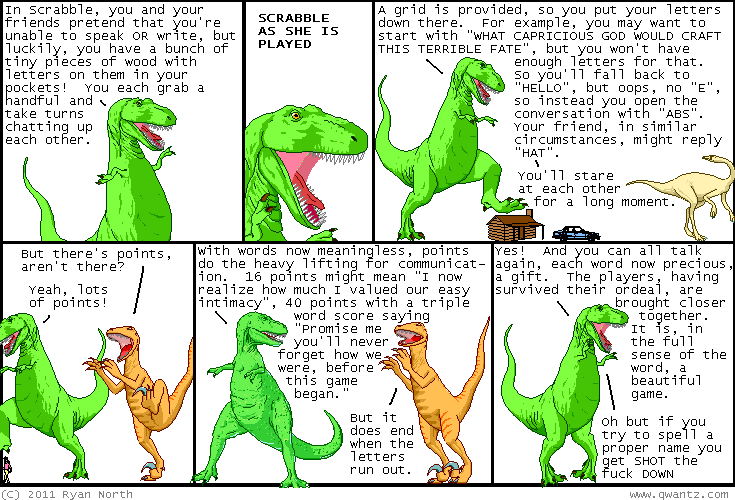 This 25 minute lesson gives students a basic sense of how critical literacy and awareness help a reader gain more control over the meaning of a text by reading and creating Dinosaur Comics. Students will be able to demonstrate some or all of the four suggested techniques by constructing and analyzing Dinosaur Comics. Students will be able to critique each other’s comics by examining how critical literacy techniques affect their reading. How can a reader’s sense of control help them? 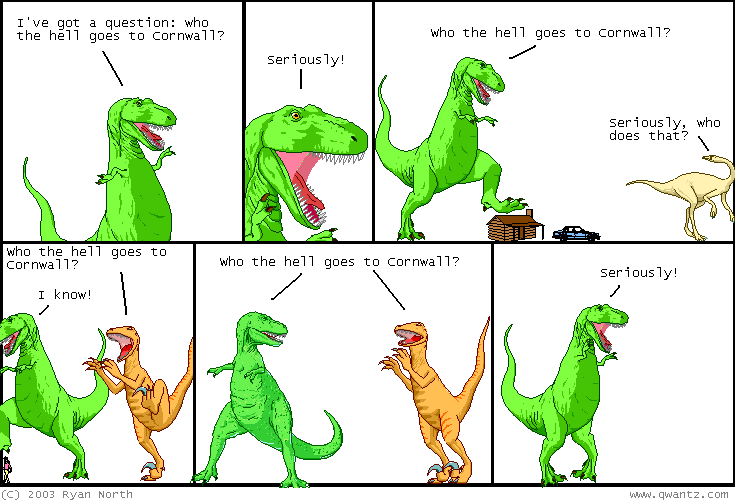 Lay out a series of Dinosaur comics. Pick one. Read it. After reading it, consider whether or not you understood it, whether you found it funny, and what you think someone would need to know in order understand it. If you didn’t understand it, think about what you feel you were missing. Share your comic with a partner. Allow them to read it as you read theirs. Explain how you felt about each one and what you felt you needed to understand it. Choose another comic, lather, rinse, repeat! Chapter 3 of Teaching Students to Read Like Detectives focuses on the types and features of narrative texts. It offers several examples of simple routines to engage with a text. Each routine attempts to fulfill one of the four steps of critical literacy. 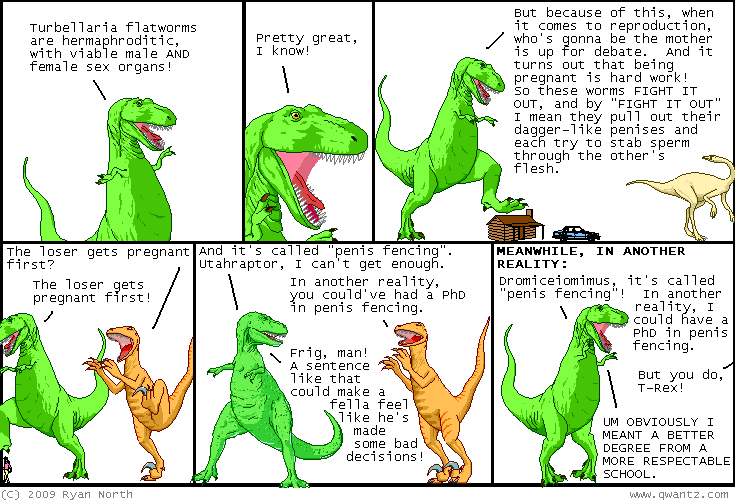 Since we’re working with these four questions, let’s look at one of these comics and dissect how each technique can be applied to Dinosaur Comics. Firstly, what’s the “commonplace?” What’s commonplace in a comic? 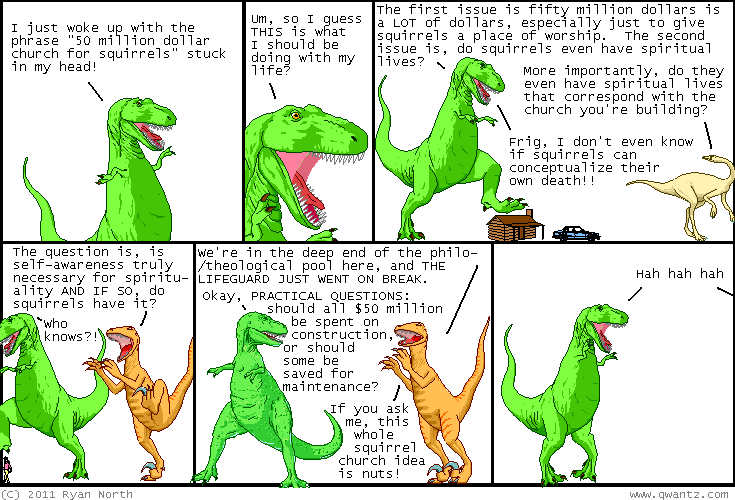 What’s commonplace in these comics? 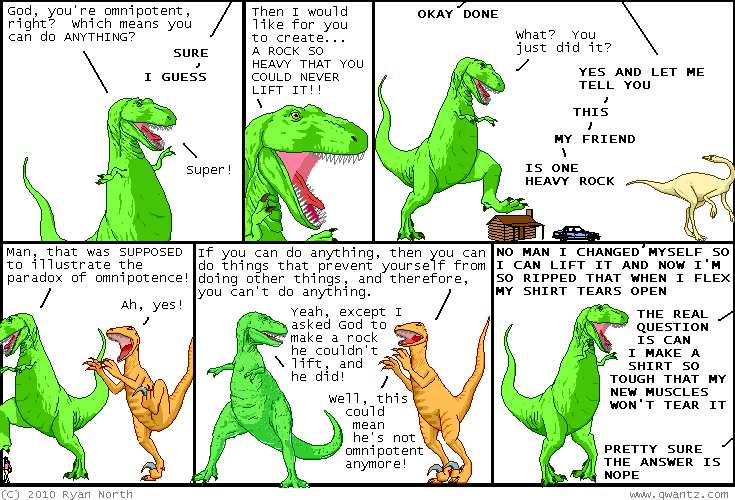 How do you think Dinosaur Comics plays on the commonplace in comics? 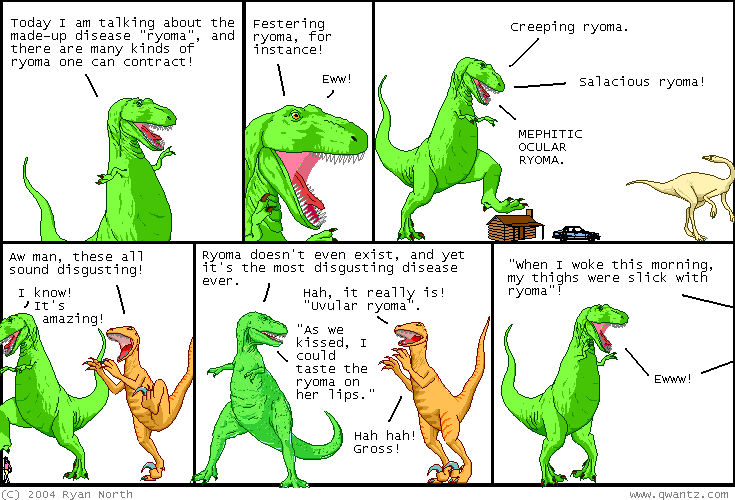 Next, the author, Ryan North, chooses what text goes in these comics and how that text relates to the images. What can you tell us about North based on your comic? Each comic has a topic that’s different. What is your comic about? What in your background allows you to read or not read the comic? How was your partner’s reading the same or different? Finally, what does it mean to read critically? 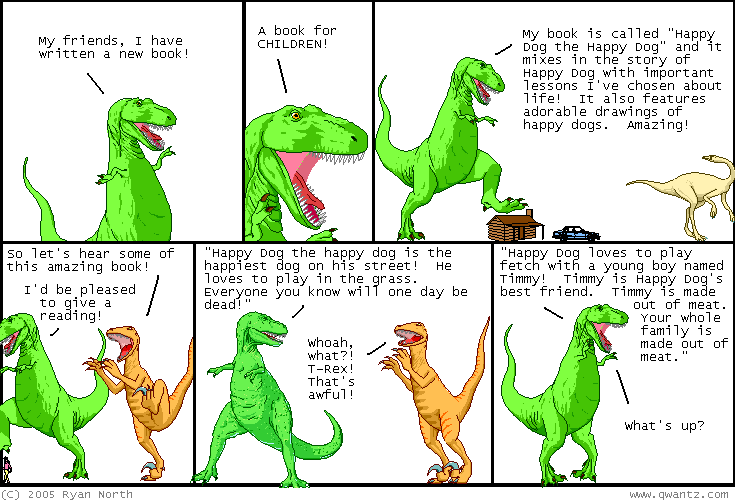 How does Dinosaur Comics require or encourage you to read critically or not? How are you involved in creating meaning when reading the comic? Do you feel included in the process? Take a copy of a blank Qwantz comic. Today, we’ll be making our own comics. Because we want this to be focused around our control and sense of agency, I would like you to write the four techniques of critical literacy on the comic, one outside each of the four edges. Keep these techniques in mind as you make the comic, since the people reading your comic will need to either experience them or experience the lack of them. We’re going to choose a common theme. Brainstorm a theme. What elements do you think we need in the text to make the comic about this theme? (If this hasn’t been established during the intro/inquiry) Because Dinosaur Comics uses the same image over and over, how can we use that repetition, that representation of the commonplace, to our advantage? Now think about the theme in relation to your life. I want you to brainstorm silently for a minute a few things you think you’ve experienced in relation to the theme that others may not have. Think about how you would include that. One of my favorite things about puns or jokes is that they often use double meanings for the humor. Find a term or two from our brainstorm list and think about possible alternate meanings and whether you can use them to add depth or make a joke. 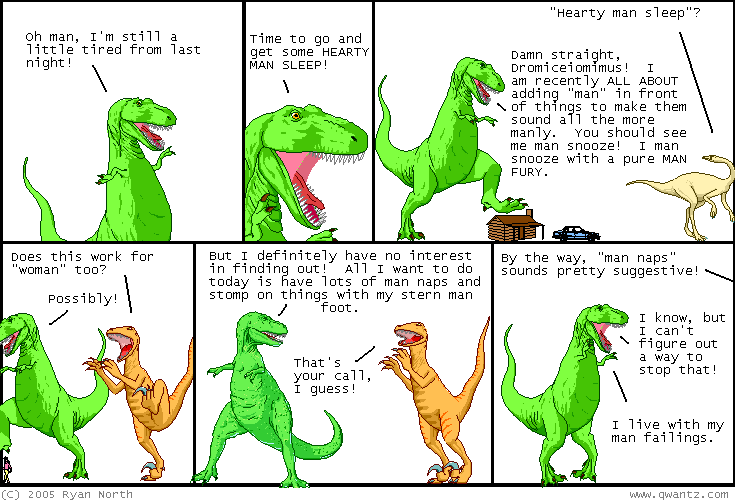 Finally, the majority of comics, especially Dinosaur Comics are referential. Do we need to do anything more to bring us to thinking critically? Now that we’ve written up a comic together, we can already see that even variations on a theme come out differently. This time, I want you to go through the process on your own. Afterward, we’ll trade comics, and as we read each other’s comics, I’d like you to think about how much control you have over what the comic means and how much control you feel your partner allowed you in reading this comic. Critical Literacy is really a means to create agency and grant control of a text to a reader. The techniques it suggests and the routines TSRD recommend allow students to gain that sense of control. The best authors and books allow the reader at least some control, but by expanding beyond the text and using the four techniques, the reader can effectively take more control and therefore engage more fully. This 25 minute lesson directly addresses police brutality and creating a sense of connection with students through flow. The material is difficult and may require trigger warnings for sensitive students. Teachers will be able to define flow. Teachers will be able to rewrite in their own words the three recommended features of implementing flow. Teachers will be able to reorganize elements of the lesson to create a sense of flow. How can we organize lessons to increase engagement and provide a sense of self-worth? By letting lessons build to a crescendo of success, students will feel more accomplished. A lesson that creates a sense of flow is more fulfilling. Learning, like work, is more successful when it’s fulfilling. 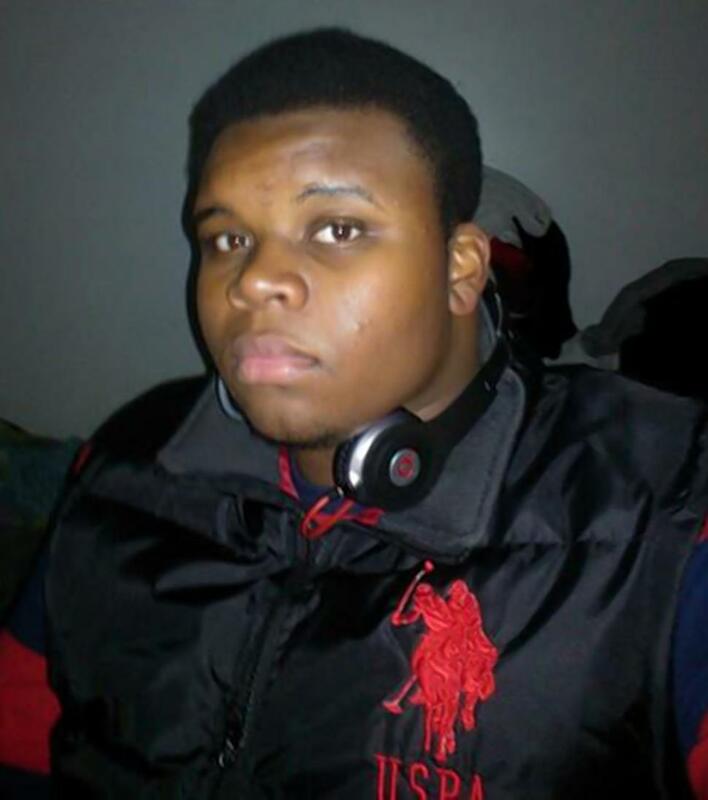 Show a picture of Michael Brown. Who is this? Hopefully students will be able to identify him, but if not, mention of his name will undoubtedly lead to conversation. Why is he important? What issues does conversation about him raise? How does seeing this picture make you feel? This week, we’ll be discussing “Flow.” Flow is defined as experiencing something so intensely that nothing else matters. Wilhelm and Smith say there are three things we can do as teachers to encourage and foster flow, making our lessons more effective. First, they suggest that we structure instruction to directly and explicitly address questions of genuine importance. Second, we need to expand notions of text and curriculum, and what counts as meaningful reading and learning. Third, we need to expand notions of competence, especially student competence, and find more ways to highlight, celebrate, name and extend it. Tonight, I am going to walk you through a series of alternate texts that I feel can connect and expand a unit on police brutality. Afterward, we’re going to select from these materials certain ones that you feel could create a sense of flow and identify how each will help foster that sense of flow. 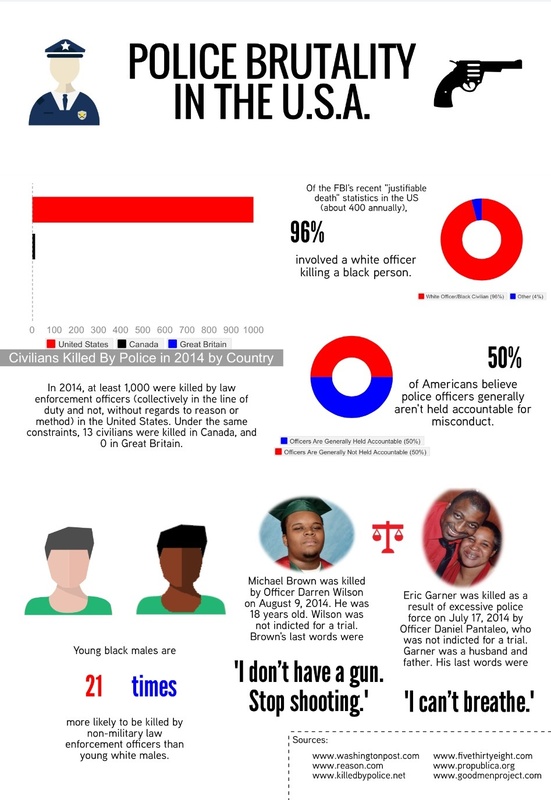 I will place on the table six physical materials: the picture of Michael Brown, Batman Issue #44 (September 9, 2015) which deals with police brutality and gentrification, a print out of the lyrics for Kendrick Lamar’s “Alright,” and a print out of three different Police Brutality infographics, one highlighting police opinion and on focusing on racial discrimination. I will also open my laptop and present them with seven interactivities: “Justice Renegade” video that explores what a video game version of police brutality might look like, the Wikipedia page for the Shooting of Michael Brown, the New York Times Q&A What Happened in Ferguson, the Huffington Post’s Police Brutality page cataloguing recent news about the topic, the Youtube video for Kendrick Lamar’s “Alright,” the body cam footage of the shooting of Sam DuBose, and an opportunity to play the small game “Police Brutality,” in which players attempt to intervene against police brutality. After walking them through each of the materials briefly, we’ll have a discussion about what they feel would work best to use to create a sense of flow. 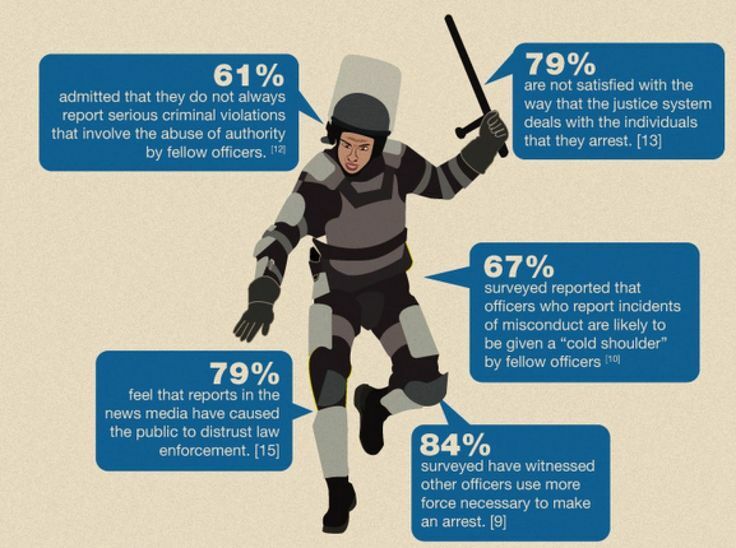 In front of you are a collection of media about police brutality. Additionally, the web browser on my laptop, I have six tabs open to relevant items and an additional program open that can be used. As we look at each one, I want you to point out if it’s genuinely relevant, whether you think it’s a more traditional resource or if it expands beyond traditional texts, and whether you think it would be an effective tool and exploring it will make us feel competent as experts in our field. As we look at them, we’ll briefly discuss each one in the manner stated above. Where do you think the best part to start is? Why did I start with the photo of Michael Brown? How do you make sure that elements of a difficult topic have trigger warnings addressing student need? How do you know if something is relevant and flows well? Which of these tools provide enough information to show expertise? Which need help from other sources? Now, I have each of these things listed on small slips of paper and there is a glue stick in front of you. Select from the slips which items you would use in a lesson or unit on Police Brutality and glue them onto our worksheet (see below) in the order you’d present them. Next to each one, write a sentence or two saying why you placed it there and whether it introduces, expands, or creates a sense of competence. If you think of something from your own experience you’d like to include, write it in. Before you get too far, here’s a print out of an article from Ijeoma Oluo about actions you can take about Police Brutality. Pay attention to the bold headers, though you can read more if you like. Think about how the pieces you select and glue could lead to one or more of these activities as a final class project. Also consider what novel or work a unit like this might be centered around and when in the unit you might want to introduce it so that it’s part of the flow. Creating Flow is about engaging in something important and relevant, expanding beyond traditional texts, and creating a sense of competency. While this is by no means an all-encompassing lesson, it provide a wide variety of elements, many of which can be found easily online, that can engage the students in a broad and relevant conversation. This 30 minute lesson goes over the 10 Essential Elements of Fostering and Teaching Reading. It’s based on Chapter 3 of What Research Has to Say About Reading Instruction by Samuels & Farstrup. Students will need to have read through the chapter or be familiar with the ideas. Teachers will be able to identify some or all of the 10 Essential Elements of Fostering and Teaching Reading Comprehension by stopping the lesson to define them or by noting their absence or need for improvement. Dixit or any one of its offshoots: Dixit Quest, Dixit Odyssey, Dixit Daydreams, Dixit Memories, Dixit Origins. What Research Has to Say About Reading Instruction. How can we tell if the 10 Essential Elements of Fostering and Teaching Reading are present or missing from our lessons? Using the 10 Essential Elements makes sure our lessons are thorough. It can be difficult to cover all 10 Essential Elements without missing one. A lesson can succeed for most students but not all students if one of the 10 Essential Elements is missing. Since you’ve read through the 10 Essential Elements of Fostering and Teaching Reading Comprehension, I’m going to jump straight in. In front of you, you should have the list of all 10 Essential Elements. Today, I’m going to teach you a game called Dixit. As I teach you, I want you to consider the 10 Essential Elements, which ones are present in learning this game and which aren’t. Feel free to check them off as you see them and to stop me and point them out. Some elements may be missing. At the end, we’ll discuss which ones are missing, why, and how we might integrate them into a lesson. To begin with, please take one card and look at it privately. Who here has played Apples to Apples? How about Cards Against Humanity? Balderdash? Wise or Otherwise? Why am I bringing up these games? Looking at your card and thinking about these other games, what do you think other people’s cards look like? How do you think Dixit is played? Now that you’ve got the idea, let’s play a couple rounds. (Identify Element 9: Observe and Assess. The scorecard will show how well people understood the game/rules, and could act as an exit ticket. Additionally, their lists of the elements should be showing check marks and throughout I’ll be checking off which elements they identify, which they can point out as my observe and assess. Now take your list. Use the space at each bullet point to list the places each element appeared. Make sure to note if you think the element only works for Dixit or if it would work with other games as well. If there are any we didn’t identify, list where they might be identified in this game or in another game. Lastly, answer the question at the bottom of the sheet (Why are games often easily engaging and how might we use them in our efforts to teach reading?) Afterward, we’ll come back together to compare notes. List answers on the white board as we go. Alright, what did you see while learning to play Dixit and where did you see it? What are a few of the other games that you think would be good to show these elements? What was missing? What games do you think would feature the elements we’re missing? Each and every one of you already knows the difference between a good lesson and a bad lesson. This list of ten elements can seem daunting, but when you stop and think about it, the good lessons we teach already have these elements involved. If a lesson isn’t working, all you need to do is slow down and recognize what elements it’s missing. Your successful lessons already include these elements even if you don’t know it. This 30 minute lesson is intended to inform teachers about the ways in which recognizing and addressing student’s cultural needs can require a lot of specific information and active awareness. This is inspired by and based off the essay by Lisa D. Delpit entitled “Skills and Other Dilemmas of a Progressive Black Educator” (PDF). Teachers will be able to explain the need for active assessment to properly tailor the learning experience to the cultural needs of students by examining, researching and writing about an object and the cultural knowledge needed to identify and understand its use. What factors might keep a student from being successful in a proven methodology? Students are less successful when they feel marginalized or underrepresented. Students may have factors in their home life that make learning difficult. If a teacher isn’t aware of a students needs, the student will be less successful. Not all factors affecting student success can be controlled or addressed in the classroom. Have you heard the saying, “Give a man a fish, he eats for a day; teach a man to fish, he eats for a lifetime”? How many of you have heard the terms skill-based learning or fluency-based learning? Without defining them, how do you think they might be connected to the adage about fishing? Which do you think is skills-based and which is fluency-based? Delpit explains that skills-based learning is intended to take provide students the means to translate their knowledge into commonly accepted forms. She implies that fluency-based learning grants students the opportunity to explore and create self-motivated opportunities for learning. I’m going to tell you the story of the greatest fisherman in the world. While I tell it, I want you to consider our discussion of skills-based learning and fluency-based learning and the fishing adage. Once there was a man who claimed to be the world’s best fisherman. Every day, he’d wade into the river in his waders, stick bait on his hook, and cast his line into the river. Every day, he’d bring back bigger, better and more fish than any fisherman around.The fisherman won every contest, rose to every challenge, and simply couldn’t be matched at his skill. “I bet people could learn a lot from watching you fish,” said one of the other fisherman. This gave the world’s greatest fisherman an idea. He could travel the world and spread his knowledge of fishing to every corner of the globe, and then everyone would be able to eat like kings. Knowing that fishermen listen best to other fisherman they respected, he decided he would go out and challenge the best fisherman in each place and, once he had earned his respect and shown how great a fisherman he was, they would listen and tell others, teaching them everything they needed to know. First, the fisherman traveled to the ocean. He found a commercial fisherman on a renowned boat. He challenged the fisherman, showing him his rod and his reel, his tackle-box and waders, his bait and his bucket. He showed him how to cast his line and patiently wait. But the commercial fisherman just laughed. “That won’t work here,” he explained. “The sea is too rough. We use large nets that we drag behind the boat and collect enough fish in two days for the week.” The fisherman was disappointed that the commercial fisherman didn’t like what he had shown him. Clearly he knew other ways to fish. Next, the fisherman headed north to the frozen tundra where food was scarce. He found a renowned ice fisherman in the village ice house. He challenged the fisherman, showing him his rod and his reel, his tackle-box and waders, his bait and his bucket. He showed him how to cast his line and patiently wait. But the ice fisherman just laughed. “That won’t work here,” he explained. “The ice stays frozen all winter and weather is too cold to stand outside cutting and fishing in big holes. We stay in huts with small holes cut deep into the lakes and catch all the fish we need with patience.” The fisherman was disappointed that the ice fisherman didn’t like what he had shown him. Clearly he knew other ways to fish. Finally, the fisherman headed back home. As he got closer, the towns that he stopped in grew more receptive to his teaching. In one small town he found an orphan boy and decided he would teach him to fish like a king. He called the boy over, showing him his rod and his reel, his tackle-box and waders, his bait and his bucket. He showed him how to cast his line and patiently wait. But the just looked at him like he was crazy. “I’m sorry, mister, but I don’t have the money for all your fancy tools. Besides, why would I waste my money on that when I already know how to tickle a trout and catch it with my bare hands?” The fisherman was dumbfounded. He was shocked the boy could catch a fish like that. When he returned home, the fisherman told all his friends what he had seen. There were dozens of ways to fish, and not everything he knew would work in every case. Moreover, the fisherman found himself changing how he fished, using some of the things he had learned to be an even better fisherman. In this story, the fisherman was a master of his modality, fishing with a rod and reel in rivers. Why wasn’t he successful in bringing his technique into other realms? What sort of reasons did the other fisherman and the orphan boy give for his techniques not working? I have here an object (in this case, a lobster cracker and lobster fork, though any culturally specific object would work). Get out a piece of paper and write a paragraph telling me what it is and how you know. Afterward, we’ll come back together and share our object and how you know. How would someone know what this is? What specific cultural knowledge do you have or would you need to understand the object? How does trying to recognize this object mimic recognizing the needs of your students? What sort of questions would you need to ask in order to understand this object with no prior knowledge? What do you think the ramifications of making assumptions and getting it wrong would be? Select a number of other objects or photos of objects that are culturally relevant, obscure, and unique. You cn duplicate items or photos, but definitely have a variety. Choose one of these objects/photos that you don’t recognize. Take a minute to do the same thing we just did, telling me what you think it is and how you know. Then hop on google, figure out what it is and write that as well. If you’re having trouble, I’ll help you find the object. Finally, add a third paragraph explaining three ways in which someone could’ve learned this and why it is or is not be obvious to people who don’t have this background. Collect assignments and grade based on whether they recognized valid cultural/economic deficiencies for their chosen object. Delpit’s argument is essentially that not everyone has the same resources at their disposal and will react differently to different techniques based on their needs. All of our techniques are meant to “teach a man to fish,” so to speak, but different students will need different techniques based on their circumstances. Experimenting with fluency-based learning, in this case exploration of the object, can be fun and might even be partially successful, as some of you could infer your objects based on other factors. Skills-based learning, in this case represented by looking up the objects, can provide us the tools effectively deal with an area with which we’re unfamiliar. Either way, it’s most important to recognize the deficiencies in our model and adjust to the needs of the students. This 30 minute lesson is intended to introduce students to expository texts, the GIST model, and the fact that understanding expository texts can equip them to make a difference in the world. Students will be able to use the GIST model to summarize an expository text. How does understanding expository texts equip us to think critically? Understanding how to read an expository text allows us to critique the information imparted. Expository texts provide factual information. Expository texts sometimes pick and choose the information they offer for a reason. Being able to compare multiple sources gives us a better understanding of the information. What is an expository text? How does it work? What things do you usually see in expository texts? Why? As we’ve discussed, expository texts come in multiple forms and have specific features that help us know how to read them. Because of our limited time, I’m going to walk you through one of them: Summarizing, using the GIST methodology. GIST stands for “generating interactions through schemata with text.” Being an acronym is really just a way to keep all the letters capitalized. By breaking the text into parts, perhaps a paragraph at a time or a few paragraphs at a time, we can summarize the text part by part to create a better sense of the whole. Students who attempt to summarize after reading a full text, especially a dense one, will often forget parts, facts, or become confused before they get to summing up. By breaking it up and summarizing as we move along the text, we will lose less information and build a better understanding of the text. The important things to remember with the GIST model is to limit each summary sentence to no more than 20 words, and to keep the chunks of text roughly even. Hand out the GIST bookmarks or guide. If you have a dot projector, it’s a good idea to annotate and work along with the class on that so everyone can see and/or copy. Make sure if you do so that you check for understanding on the annotations and that your students can reproduce or explain the annotations you make together. I highly recommend doing the first paragraph together and then letting students take the reigns for the remainder. Let’s look at this article from the Smithsonian about Rebecca Fried, an eighth grader who published a scholarly paper and made a fool out of a renowned history professor. It’s seven paragraphs long. We’ll read through it together breaking it up into two paragraph chunks for each summary sentence. Every chunk, we’ll pause and formulate a summary sentence in the worksheet. When we finish, we’ll combine the sentences into a summary paragraph and see how we feel about it as a summation. This article is a longer, more involved piece from the Daily Beast, a more entertainment-angled online publication. I want you to try doing this on your own for this article. This article is 6 pages long. Do a summary sentence for several paragraphs instead of every two paragraphs. Get as far as you can in the next 10 minutes; it’s ok if you don’t finish. Try to have no less than five summary sentences and no more than eight. Remember to limit sentences to no more than 20 words. In addition, as you’re reading through, I want you to consider the differences in tone, information, depth, and purpose in this article from the last. Give students time to work. Remind them of their time constraints. Check in with individuals on their progress and offer help if needed. Partner up with someone else and compare your summaries. While they’re comparing their summaries, here are some questions you can ask the students as they chat, especially if their comparison stalls. What did you miss that they got? What did they miss that you got? How successful do you think the GIST model was? What were the biggest differences between the two articles? When you read on your own, especially non-fiction, do you find yourself pausing, contemplating and summarizing in your head if not on paper? When you run into expository texts from non-scholarly publications, how do they differ? How do you think a variety of texts on the same or similar subject can help teach critical thinking about the nature of sources and the accuracy of information imparted by authority figures? Kindly hand in your summaries. As we move forward, consider how you might need to adjust the GIST model for fictional texts. How could you compare an expository text to a fictional one? Remember that Rebecca Fried was able to take down a professor who was pushing a racist agenda simply because she knew how to read and analyze expository texts. As the X-Files says, the truth is out there. If you keep at it, you can find the truth and expose it. If you can I assign readings, you might ask them to do the same task for a variety of different texts and share their summaries the following day. This encourages learning new information rather than remaining stagnant. In partners, they could also analyze how well they thought their classmate summarized their text by reading the summary, then the article and discussing it. Given that this is a routine to be used over and over, it would be something we’d need to come back to regularly in a classroom. Ideally, I’d want to present this strategy over a week or two, and then several others in their own segments, and finally allow them to choose their strategy individually on a more independent project after they’ve tried a variety (the dartboard method of teaching technique, as I like to call it).